I'm trying to draw a straight line from the top of a graph to its bottom without defining specific y-values but only saying from 0% to 100% of the y-axis. The x-value, however, should be set in the coordinate system of the graph. I'm running compat=1.15, so I don't need to add axis cs: before the coordinates to let them match the real graph. I think, that I'd need to use two different coordinate systems. 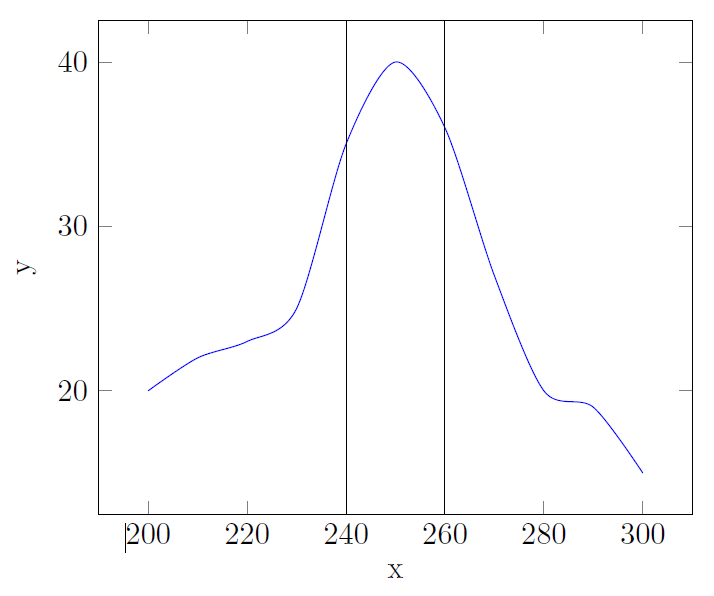 For the x-value the default axis cs comes in handy but for the y-value I'd rather need the axis description cs. Please note that the default graphs in pgfplots do have a little margin on each side, so even if I would enter the y-values manually the line wouldn't be from the very top to the very bottom, which it should be. As can be seen in the MWE, setting a value that is smaller than the smallest plotting value gives the correct result, so a possible hack could be to just use extreme numbers, but I don't like that idea. Which both use the perpendicular coordinate system, which takes two points (let's call them p and q), draws a vertical line from one and a horizontal line from the other, and returns the intersection point of these lines. The implicit syntax can be used as: (p-|q) or (p|-q). The -| means that I want to use the intersection of a horizontal (-) line coming from p, and a vertical (|) line coming from q. Similarly, the |- means the same, but the other way around. In principle this means that for -| I am using the y coordinate of p, and the x coordinate of q, discarding the x of p and the y of q.